Have you ever heard of Zentangle art? Living with a tween girl will really teach you things! I had never heard the word "Zentangle" until I started drawing a paisley style doodle on this faux white pumpkin last week. My daughter strolled in and mentioned how cool it was that I was drawing a Zentangle. Um.What? What's a Zentangle?! Thank you GOOGLE for the quick explanation - you help me maintain my "in the know - still somewhat cool" mom status on the regular these days. Why yes! I was indeed drawing a "Zentangle" but unbeknownst to me. I had this faux white pumpkin on hand from a clearance sale last year, and I could'n't really figure out what to do with it. I grabbed my pencil and started to doodle on it. 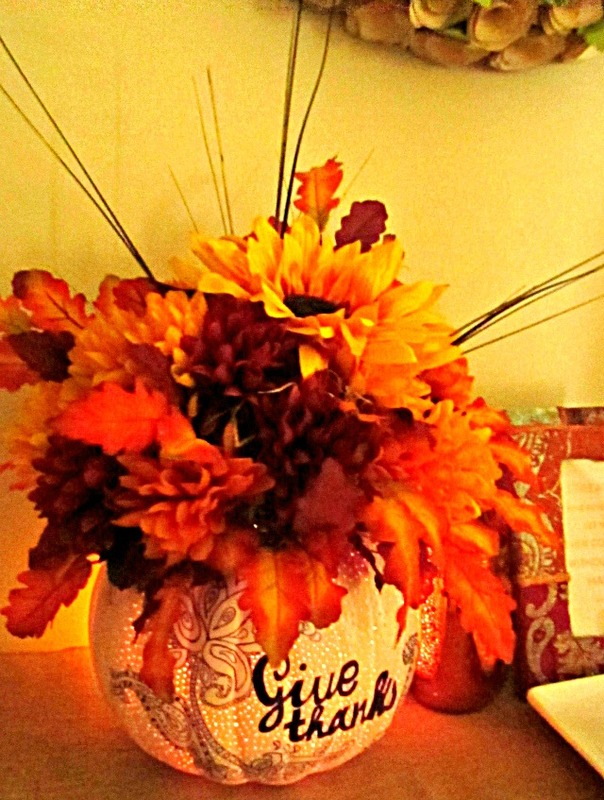 I lettered out "give thanks" then framed it with a paisley style doodle on the top and bottom corners. Next, I grabbed my fine point black Sharpie and started to fill in the lettering and outline my doodle. When finished, I went back and gently erased any remaining pencil marks. After the Zentangle was completed, I grabbed some tooth picks and left over bamboo skewers, and poked a variety of different sized holes in the face of the pumpkin; around the perimeter of the design and lettering. I completed the lighted pumpkin base/vase with a 5 watt light from A.C. Moore ($2.99), and I made a pretty little Fall arrangement for the top. The arrangement is suspended with floral foam that I cut to fit the carved hole in the top of my pumpkin. I secured the foam/arrangement with hot glue. 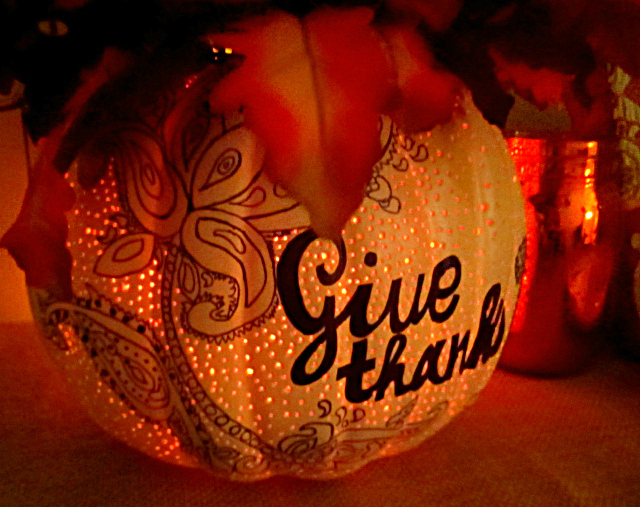 It sits just inside the top of the pumpkin, which left the entire bottom inside portion of the pumpkin free for the lamp. NOTE: I replaced the 5 watt bulb that came with the lamp with a LED bulb, as the LED bulb produces little to no heat. Check out the supply list to make your own lighted Sharpie Zentangle Fall Pumpkin Vase below, along with my step-by-step image tutorial. I placed my pumpkin on my entryway table and put it on a timer. 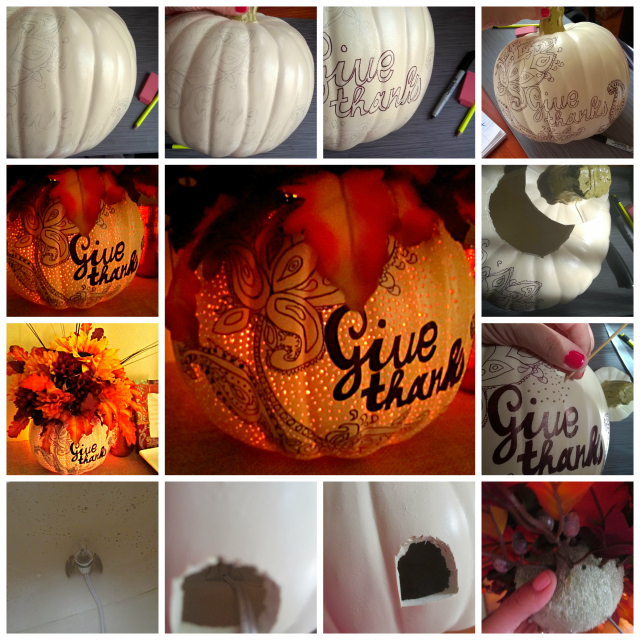 I love the soft glow that comes through all of the little holes in the pumpkin, in the evening when it turns on. Fall has arrived - it's my absolute favorite time of year! Happy Fall everyone & happy crafting! I want to do this really pretty Halloween decoration and having a Pumpkin Vase that lights on my countertop would be amazing! I really like this idea - Happy Halloween! This is a very nice decoration.